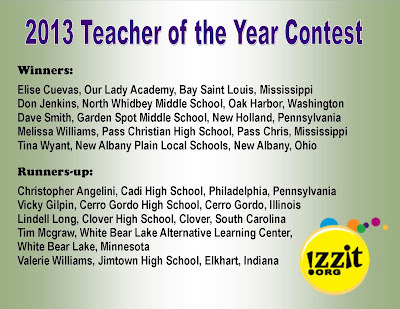 izzit.org News: Teacher of the Year winners! 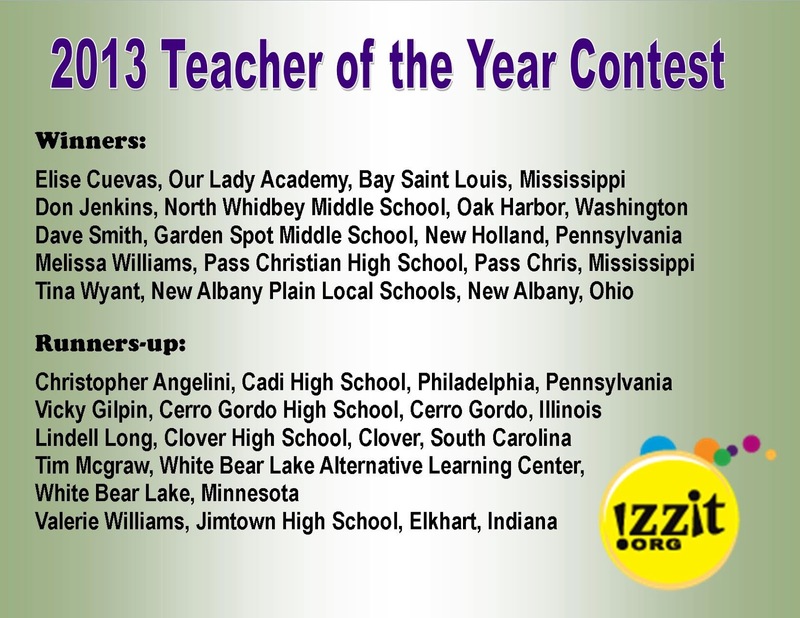 Congratulations to all of our Teacher of the Year winners and the runners-up! As you can see, our winners are classroom teachers from all across the United States, from Pennsylvania to Washington. On average, they’ve taught for 13 years in their current schools. Most of them hold advanced degrees, including one doctorate. They teach a variety of subjects and grade levels, from English & Composition, Social Studies & History, Government & Economics, to Business Education and Mathematics. Many of our winners enjoy spending time with their families and pets. Other top hobbies include reading, running, cooking, and traveling. More unique pastimes listed were genealogy and blogging, and one of our winners is also a professional singer who shares his name with a very famous (though a different genre) professional singer. Our winning teachers use izzit DVDs in their classrooms because not only do the videos present complex concepts clearly, but they also make the concepts real and relevant to their students. Our teachers also like using them to meet common core standards of exploring/discussing themes in multiple formats. The runners-up won $150, a complete library of izzit educational DVDs, lifetime PLUS membership, and an izzit fleece/hoodie. In addition to that, our winners receive a $2,000 prize (instead of $150) and will be presented with The David and Annette Jorgensen Award for Excellence at a formal awards banquet on June 19, 2013 in Chicago, IL. This is an all-expenses paid trip for each winning teacher. We look forward to meeting our winners in Chicago in June!